Objectives: Cardiac transplant is a life-saving procedure for patients with end-stage heart failure. Preoperative pulmonary vascular resistance is indicative of intrinsic pulmonary vascular disease and correlates with posttransplant survival. However, its measurement is costly and time consuming. Therefore, simpler techniques are required. Diastolic transpulmonary gradient reportedly indicates intrinsic pulmonary vascular disease. Here, we investigated the relationship between preoperative diastolic transpulmonary gradient with preoperative pulmonary vascular resistance and 1-year and overall mortality among cardiac transplant patients. Materials and Methods: Fifty-one patients who underwent cardiac transplant between 2006 and 2017 were included. All patients underwent preoperative right and left heart catheterization and oxygen study. Among these, diastolic transpulmonary gradient, mean transpulmonary gradient, and pulmonary vascular resistance were correlated with one another and 1st-year and overall mortality rates. Patients were grouped according to whether they received diastolic transpulmonary gradient or not, and both groups were compared with respect to 1-year and overall mortality. Binary logistic regression analysis was done to test whether diastolic transpulmonary gradient was a significant predictor of 1-year and overall mortality. Results: Mean patient age was 45.5 ±9.8 years. The 1-year and overall mortality rates were 21.6% (11/51) and 37.3% (19/51), respectively. Diastolic transpul­monary gradient was significantly correlated with pulmonary vascular resistance, 1-year mortality, and overall mortality (P < .05) and was a significant predictor of 1-year and overall mortality (odds ratio 6.0; 95% confidence interval, 1.4-25.3; P < .05 and odds ratio 4.8; 95% CI, 1.4-17.5; P < .05, respectively). Patients with a diastolic transpulmonary gradient of ≥ 7 mm Hg had significantly higher 1-year and overall mortality (P < .05). Conclusions: Diastolic transpulmonary gradient can be used as a promising easy-to-use parameter of intrinsic pulmonary vascular disease and a predictor of 1-year and overall mortality among patients undergoing cardiac transplant. Cardiac transplant is a life-saving procedure for a number of disorders, including ischemic cardio­myopathy, dilated and hypertrophic cardio­myopathy, fulminant myocarditis, and other types of cardiomyopathies.1,2 Increased pulmonary pressures, and in turn right ventricular and right atrial pressures, before cardiac transplant increase the risk of death among cardiac transplant recipients. Although pulmonary hypertension is usually due to increased left heart pressures responsible for heart failure, several studies have suggested that increased pulmonary pressures, particularly intrinsic irrever­sible pulmonary vascular disease, also known as precapillary pulmonary hypertension, increase the risk of posttransplant right ventricular failure and death.3-5 Thus, it is imperative to identify those with reactive pulmonary changes that are irreversible and potentially put the transplanted heart in jeopardy before transplant. Measurement of pulmonary vascular resistance (PVR) is traditionally the criterion standard for identifying those with reactive pulmonary changes. However, conducting an oxygen study and its flow dependence sometimes makes measurement of PVR unideal. Thus, simpler and flow-independent techniques to identify intrinsic pulmonary vascular diseases are needed. Diastolic pulmonary gradient (DPG; defined as the difference between diastolic pulmonary artery pressure [DPAP] and pulmonary capillary wedge pressure [PCWP]) is a newly introduced flow-independent marker of intrinsic pulmonary vascular disease not caused by passive increases in pulmonary pressures due to elevated left-sided filling pressures.6,7 Its use in various conditions affecting pulmonary vasculature has been tested.8-11 A few studies have investigated its role in identifying intrinsic pulmonary vascular disease in cardiac transplant patients.12,13 Here, we investigated associations between DPG and posttransplant 1-year and overall mortality and its relationship with PVR among patients scheduled for cardiac transplant procedures. This was a retrospective study involving 51 adult patients who were older than 18 years and who received orthotopic heart transplant at Başkent University Faculty of Medicine, Department of Cardiology (Ankara, Turkey) between 2014 and 2016. This study was approved by our local ethics committee. Demographic data of the patients were recorded. The preoperative right-left heart catheterization data, including right and left heart pressures (right atrial, right ventricular), systolic pulmonary artery pressure, DPAP, mean pulmonary artery pressure (MPAP), PCWP, left ventricular end-diastolic pressure, cardiac output (CO), and PVR, were recorded. Diastolic pulmonary gradient was calculated as the difference between the DPAP and mean PCWP. Mean trans­pulmonary gradient (TPG) was calculated as the difference between MPAP and mean PCWP. Pulmonary vascular resistance in Woods units (WU) was calculated by the following formula: (MPAP – mean PCWP/CO) × 80. Cardiac output was calculated by the Fick formula as follows: CO = 3 mL × weight (kg)/[Hb × 1.36 × SaO2) - (Hb × 1.36 × SpO2] × 10, where Hb denotes hemoglobin con­centration, SaO2 denotes aortic oxygen saturation, and SpO2 denotes pulmonary artery oxygen saturation. We recorded 1-year and overall mortality rates and transplant rejection data, obtained from pathologic examinations of the serial endomyocardial biopsy samples. Statistical analyses were performed with SPSS software (SPSS: An IBM Company, version 21, IBM Corporation, Armonk, NY, USA). The 1-year and overall mortality rates were compared between patients with and without DPG ≥ 7 mm Hg. Diastolic and mean transpulmonary gradients were correlated with PVR and 1-year and overall mortality rates using Pearson correlation analysis. A binary logistic regression analysis was performed to determine whether DPG ≥ 7 mm Hg contributed to 1-year and overall mortality. Kaplan-Meier survival curves with log-rank tests were used to observe the effects of DPG ≥ 7 mm Hg on 1-year and overall mortality. Table 1 shows the demographics properties of the study population. The study population had a mean age of 45.5 ± 9.8 years at transplant. Of the 51 included patients, 40 (78.4%) were male. 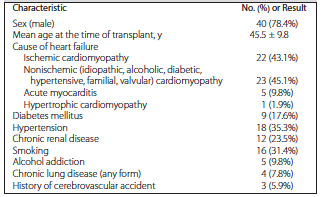 The causes of heart failure included ischemic dilated cardi­omyopathy in 22 patients (43.1%), nonischemic (idiopathic, alcoholic, diabetic, hypertensive, familial, valvular) cardiomyopathy in 23 patients (45.1%), acute myocarditis in 5 patients (9.8%), and hypertrophic cardiomyopathy in 1 patient (1.9%). Table 2 shows the preoperative right-left heart catheterization results of the study population. There was a strong correlation between DPG and PVR (r = 0.525, P < .01). However, TPG and PVR were only marginally significantly correlated (r = 0.288, P = .040). The 1-year mortality rate was 21.6% (11/51), and the overall mortality rate was 37.3% (19/51). We found that 1-year mortality was significantly correlated with DPG (r = 0.303, P < .05) and PVR (r = 0.334, P < .05) but not TPG (P > .05) or the number of rejection episodes (P > .05). There were 16 patients with DPG ≥ 7 mm Hg (n = 16) and 35 with DPG < 7 mm Hg; those with ≥ 7 mm Hg DPG had significantly higher 1-year mortality rate (43.7%) than those with DPG < 7 mm Hg (11.4%; P < .05). The overall death rate was 37.3% (19/51). There was a significant correlation between overall mortality and DPG (r = 0.297, P < .05), number of rejection episodes (r = 0.282, P < .05), and PVR (r = 0.417, P < .05), but not TPG. The overall mortality rate of patients with DPG ≥ 7 mm Hg (10/16; 62.5%) was significantly higher than that of patients with DPG < 7 mm Hg (9/35; 25.7%) (P < .05). In a multivariate analysis, DPG ≥ 7 mm Hg was associated with a significantly greater 1-year mortality rate (OR = 6.0; 95% CI, 1.4-25.3; P < .05) and a significantly greater overall mortality rate (OR = 4.8; 95% CI, 1.4-17.5; P < .05). A Kaplan-Meier analysis showed a significant survival advantage of patients with DPG < 7 mm Hg compared with those with DPG ≥ 7 mm Hg (P < .01) (Figure 1). Our study demonstrated that DPG was significantly associated with PVR and that both DPG and PVR were significantly associated with 1-year and overall mortality. In addition, DPG was also a significant predictor of 1-year and overall mortality in multivariate analysis. In contrast, TPG was not significantly correlated with mortality and only borderline significantly correlated with PVR. 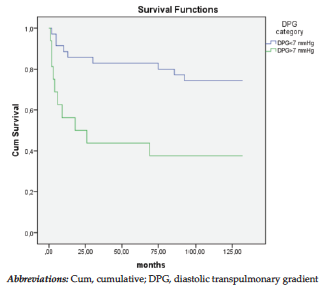 Our results suggest that, among patients scheduled for cardiac transplant, DPG is closely correlated with PVR and thus may be a surrogate marker of PVR and that DPG may successfully predict mortality both at 1 year and anytime after cardiac transplant. Diastolic pulmonary gradient has the advantage of not necessitating an oxygen study or CO measurements, thus reducing radiation exposure and right and left heart catheterization time, cost, equipment, and staff. This simple parameter could therefore be utilized to make decisions regarding performance of cardiac transplant, perhaps without the need for measuring PVR. So far, DPG has not been effective in predicting mortality after cardiac transplant.12,13 However, we demonstrated that DPG was significantly correlated with PVR and that both DPG and PVR were significantly correlated with 1-year and overall mortality. We also found that DPG was a significant predictor of 1-year and overall mortality in multivariate analysis. Our results suggest that DPG should be prospectively studied to investigate its prognostic significance in cardiac transplant patients. Because an accurate measurement of PVR needs an oxygen study, thus requiring more time, radiation exposure, equipment, cost, and staff, and because a CO measurement is also necessary, requiring knowledge about hemoglobin and patient weight, the calculation of PVR is more problematic. However, DPG is a simple parameter calculated only by subtracting an intracardiac pressure from another, thus saving time, cost, staff expenditure, and most importantly radiation exposure. Therefore, this method allows a simple prediction of precapillary pulmonary hypertension and death at posttransplant follow-up. These points should be clarified in large-scale prospective studies. This study has some limitations. First, this was a retrospective study, with a small number of patients. Second, a DPG measurement is prone to significant errors. Catheter motion artifacts can lead to errors in DPAP measurement. Inaccurate wedging of the catheter can result in overestimation of PCWP, whereas the recording of mean PCWP measurements averaged throughout the respiratory cycle, rather than those measured at end expiration, can result in underestimation of PCWP.24 Small errors in the measurement of either variable will have a major impact on DPG due to its relatively low absolute value. In addition, the DPG has been shown to increase with heart rate in a linear fashion,25 thereby potentially limiting its utility. This study showed that diastolic transpulmonary gradient, an easy-to-calculate parameter, is closely related to invasively derived pretransplant pulmonary vascular resistance and 1-year and overall mortality among cardiac transplant recipients. Further prospective trials with larger sample sizes are needed to verify the findings of this study. Mehra MR, Canter CE, Hannan MM, et al. The 2016 International Society for Heart Lung Transplantation listing criteria for heart transplantation: A 10-year update. J Heart Lung Transplant. 2016;35(1):1-23. Lund LH, Edwards LB, Dipchand AI, et al. The Registry of the International Society for Heart and Lung Transplantation: Thirty-third Adult Heart Transplantation Report-2016; Focus Theme: Primary Diagnostic Indications for Transplant. J Heart Lung Transplant. 2016;35(10):1158-1169. Chen JM, Levin HR, Michler RE, et al. Reevaluating the significance of pulmonary hypertension before cardiac transplantation: determination of optimal thresholds and quantification of the effect of reversibility on perioperative mortality. J Thorac Cardiovasc Surg. 1997;114(4):627-634. Kirklin JK, Naftel DC, Kirklin JW, et al. Pulmonary vascular resistance and the risk of heart transplantation. J Heart Transplant. 1988;7(5):331-336. Costard-Jackle A, Hill I, Schroeder JS, Fowler MB. The influence of preoperative patient characteristics on early and late survival following cardiac transplantation. Circulation. 1991;84(5 Suppl):III329-337. Naeije R, Vachiery JL, Yerly P, Vanderpool R. The transpulmonary pressure gradient for the diagnosis of pulmonary vascular disease. Eur Respir J. 2013;41(1):217-223. Gerges C, Gerges M, Lang MB, et al. Diastolic pulmonary vascular pressure gradient: a predictor of prognosis in "out-of-proportion" pulmonary hypertension. Chest. 2013;143(3):758-766. Heinonen J, Salmenpera M, Takkunen O. Increased pulmonary artery diastolic-pulmonary wedge pressure gradient after cardiopulmonary bypass. Can Anaesth Soc J. 1985;32(2):165-170. Her C, Mandy S, Bairamian M. Increased pulmonary venous resistance contributes to increased pulmonary artery diastolic-pulmonary wedge pressure gradient in acute respiratory distress syndrome. Anesthesiology. 2005;102(3):574-580. Harvey RM, Enson Y, Ferrer MI. A reconsideration of the origins of pulmonary hypertension. Chest. 1971;59(1):82-94. Her C, Cerabona T, Baek SH, Shin SW. Increased pulmonary venous resistance in morbidly obese patients without daytime hypoxia: clinical utility of the pulmonary artery catheter. Anesthesiology. 2010;113(3):552-559. Tampakakis E, Leary PJ, Selby VN, et al. The diastolic pulmonary gradient does not predict survival in patients with pulmonary hypertension due to left heart disease. JACC Heart Fail. 2015;3(1):9-16. Tedford RJ, Beaty CA, Mathai SC, et al. Prognostic value of the pre-transplant diastolic pulmonary artery pressure-to-pulmonary capillary wedge pressure gradient in cardiac transplant recipients with pulmonary hypertension. J Heart Lung Transplant. 2014;33(3):289-297. Vachiery JL, Adir Y, Barbera JA, et al. Pulmonary hypertension due to left heart diseases. J Am Coll Cardiol. 2013;62(25 Suppl):D100-108. Lam CS, Roger VL, Rodeheffer RJ, et al. Pulmonary hypertension in heart failure with preserved ejection fraction: a community-based study. J Am Coll Cardiol. 2009;53(13):1119-1126. Galie N, Hoeper MM, Humbert M, et al. Guidelines for the diagnosis and treatment of pulmonary hypertension: the Task Force for the Diagnosis and Treatment of Pulmonary Hypertension of the European Society of Cardiology (ESC) and the European Respiratory Society (ERS), endorsed by the International Society of Heart and Lung Transplantation (ISHLT). Eur Heart J. 2009;30(20):2493-2537. Fang JC, DeMarco T, Givertz MM, et al. World Health Organization Pulmonary Hypertension group 2: pulmonary hypertension due to left heart disease in the adult--a summary statement from the Pulmonary Hypertension Council of the International Society for Heart and Lung Transplantation. J Heart Lung Transplant. 2012;31(9):913-933. Moraes DL, Colucci WS, Givertz MM. Secondary pulmonary hypertension in chronic heart failure: the role of the endothelium in pathophysiology and management. Circulation. 2000;102(14):1718-1723. Givertz MM, Colucci WS, LeJemtel TH, et al. Acute endothelin A receptor blockade causes selective pulmonary vasodilation in patients with chronic heart failure. Circulation. 2000;101(25):2922-2927. Guazzi M, Borlaug BA. Pulmonary hypertension due to left heart disease. Circulation. 2012;126(8):975-990. Mehra MR, Kobashigawa J, Starling R, et al. Listing criteria for heart transplantation: International Society for Heart and Lung Transplantation guidelines for the care of cardiac transplant candidates--2006. J Heart Lung Transplant. 2006;25(9):1024-1042. Rapp AH, Lange RA, Cigarroa JE, Keeley EC, Hillis LD. 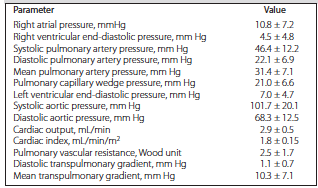 Relation of pulmonary arterial diastolic and mean pulmonary arterial wedge pressures in patients with and without pulmonary hypertension. Am J Cardiol. 2001;88(7):823-824. Champion HC, Michelakis ED, Hassoun PM. Comprehensive invasive and noninvasive approach to the right ventricle-pulmonary circulation unit: state of the art and clinical and research implications. Circulation. 2009;120(11):992-1007. Enson Y, Wood JA, Mantaras NB, Harvey RM. The influence of heart rate on pulmonary arterial-left ventricular pressure relationships at end-diastole. Circulation. 1977;56(4 Pt 1):533-539. Acknowledgements: This study was supported by the Başkent University Research Fund (Research Protocol No: KA17/320). The authors have no conflicts of interest to declare.